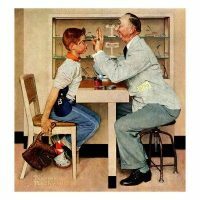 The family doctor of Norman Rockwell paintings, who lived in town, made house calls and treated patients from cradle to grave is a mere memory in today’s mobile society – according to the U.S. Census Bureau, the average American will move approximately 11 times in their life, and most of these moves—not to mention changes in insurance coverage, second opinions and other life circumstances—will require a change in medical providers. On the surface, public policy encouraging healthcare standardization sounds like a good idea, allowing individuals to get consistent care whether they visited a big city hospital or a small rural clinic. For many procedures it makes sense: broken legs require an x-ray, a cast and perhaps some physical therapy after the bone heals. One goal of the Affordable Care Act (ACA), was to encourage such systemization by changing billing practices to focus on outcomes rather than the number of procedures and tests it took to achieve them, pushing healthcare providers to follow standard best practices instead of piling on billable diagnostics. But a major unintended consequence was massive consolidation: because medical groups attached to a hospital system received higher reimbursements, doctors lined up to make their practices hospital outpatient centers. And because proving successful outcomes for full reimbursement required an arsenal of providers to keep patients in the hospital system, hospitals were eager to snap up small medical practices. The stage was accidentally set for healthcare monopolies. Hospital consolidation leads to higher costs—both financial and social—without any significant improvement in healthcare outcomes. The first casualty of small, independent practices is personalized care; as healthcare providers shift from individual practitioners to hospital workers, the focus moves from the practice of medicine as a long relationship between an individual provider and an individual patient. My newborn’s first doctor at the hospital was not a pediatrician that would come to know her as a patient over a decade, but a neonatologist contracted to the hospital by an outside staffing group. With low job satisfaction and high turnover, we couldn’t even contact him two weeks later when we had a question about the initial exam – he had already left the company. In its worst incarnations, however, the problem goes beyond nostalgia for the town physician. When healthcare providers are drawn into the orbit of large hospital systems, they are increasingly required to concern themselves with corporate interests and brand management. Where doctors had learned to focus on patient health outcomes, they must now add a focus on providing a good customer experience. Improving providers’ soft skills is unquestionably beneficial for all involved, however, “good customer service” is too often a euphemism for a kind of standardization that is not in the interest of patient or provider. To maintain a strong brand, hospital systems need clinics that provide standardized care; a patient walking into one clinic should be able to start a treatment plan, change providers or clinics within the brand and have the same treatment and the same experience. But while this strengthens the brand, it simultaneously reduces medical practice from the culmination of years of training of human anatomy and physiology into the skills necessary to make a fast food hamburger. Healing people is both an art and a science. While evidence-based practice offers guidelines for best practices, patients do not generally fit into a cookie cutter model for treatment, nor does the same approach work with every patient. Further, medicine is often a long game; health changes, especially for chronic conditions, are not instantaneous. Maintaining someone’s health is the result of creating a long relationship with a trusted healthcare provider, not just being seen by whoever is available. While providers can hope to build a connection with every patient who sits across from them, building the right relationship is more than just a trainable soft skill. Our current healthcare billing model already devalues the necessary time to build relationships; further policy changes have led to almost inevitable hospital monopolization, which promises to turn skilled medical practice into assembly-line labor. Unless we are able to find room for personal relationships and human interaction in our medical care, ultimately, we will all suffer.